Through his engaging keynotes, this former Navy fighter pilot and Prisoner of War will entertain and inspire you. There is a reason why Captain Charlie Plumb is one of the most sought after achievement and motivational speakers of our time. He personalizes (for each audience) a highly motivational message of overcoming adversity… His and Yours. Whether he is delivering a Keynote, a Safety Seminar, or a Workshop – he is bold and dynamic. His message is powerful, it is entertaining, and it is delivered with high energy and passion. 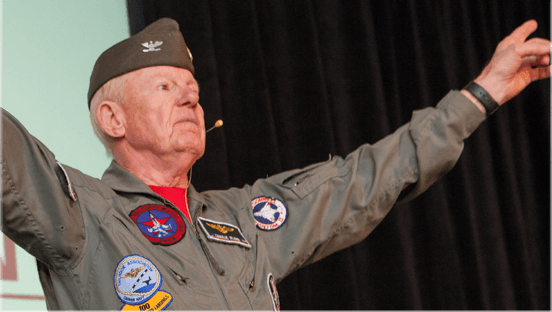 Shot down during a combat mission over North Vietnam, Captain Charlie Plumb survived almost six years as a Prisoner Of War and emerged to tell a tale of inspiring self-reliance. In an upbeat, humorous, dynamic style he draws on this experience to demonstrate how to turn athe hard times each one of us face into assets in today’s marketplace. An expert at incorporating company jargon and industry buzzwords while still touching the hearts and minds of each audience, Captain Plumb shares his insights on coping with the challenges of everyday life and business competition, in the twenty-first century. He helps audiences break free from their own self-constructed prisons of fear, blame, and doubt. He helps them uncover a new sense of purpose and potential. He leaves his listeners wanting to achieve and excel, no matter what the obstacles. In a powerful future-focused manner, Captain Plumb illustrates the importance of living life fully and overcoming everyday adversities. More than 30% of every presentation is tailor-made to meet the client's prescribed needs and desires. In a daily routine, or in a communist prison camp, each of us has the choice to succeed, to fail…or to become the victim of circumstances. Viewed as opportunity and challenge, adversity encourages growth, and propels us beyond self-imposed limits. In a world where downsizing forces us to do more with less, we must empower the team. “Packing parachutes” can mean the difference in survival. Yours, and your teams! Invariably, just about the time things feel comfortable, change hits. And whether that change is positive or negative it can be disturbing and difficult to adjust to. Yet, it’s during those times that ones true value shows up, in taking the risks necessary to adapt to change. Each of us has assets we often times don’t tap into until we’re challenged. Whether or not we realize it, we each have the inner strength and resources to meet whatever business or personal challenges come our way. Since his return to the United States, he has presented his message to more than 5,000 audiences in every industry and from all walks of life. Selected as one of the top 10 public speakers in the country, Charlie Plumb looks forward to being a part of your next event. For more than thirty years, Captain Plumb has worked with safety conferences, awards banquets, workshops, seminars and retreats. Hundreds of companies and thousands of employees and management have benefitted from his presentations in privately owned companies, military, and government. The content of Captain Plumb’s keynote presentations can be expanded to half-day and full-day workshops or seminars. He will customize his material to target your organization’s unique needs, goals and values. As his numerous awards for Speaking / Training / Presenting prove, Captain Plumb is prepared to tailor make the perfect message to fill your precise needs. After hearing his presentation, your group will want to believe more, achieve more and be more in every facet of life. Captain draws on his experience in challenging times when stealth leadership was not only key to survival, but proved to set the Ex-POW’s on a path to astonishing success in the military, industry and government service. I had the pleasure of hearing Captain Charlie Plumb speak in Carthage, Missouri in 1977. Now, 40 years later, as CEO of a Community Health Center in Oklahoma, I was looking for a speaker for our staff Holiday Breakfast. I’ve been lucky to hear several great speakers in my life, but the one I always remembered was Charlie Plumb. So I looked on the internet and found him again. We were lucky that he could accommodate our schedule and now my entire workforce has had that same pleasure I had some 40 years ago. He was even better this time. A great message of courage and perseverance, mixed with messages appropriate to today’s workforce and climate. My entire group was touched as evidenced by the standing ovation at his conclusion. I have now ordered copies of his book for each employee. The word HERO is used too lightly anymore, but Captain Charlie Plumb is a true HERO that it is my pleasure to have heard speak again today. I would recommend him to your group. Thank you for delivering an exceptional keynote address at our annual meeting. Your contribution during our opening session played a crucial role in ensuring the success of the conference. Your presentation clearly enthralled the audience and will, no doubt, have a deep and lasting effect on those who heard it. …during your speech, I watched the recruiters in the room as they laughed with you, and then dried their eyes with you. After your speech was finished, you received one of the most awesome standing ovations I have ever witnessed. Your story is incredible, and the way you weave it into everyday life is powerful, to say the least. The fact that you not only survived, but went on to prosper greatly, is an inspiration to us all. I have attended and hosted many kick-off meetings throughout my career, but never have I heard a more compelling message. Your enthusiastic, humble delivery is superb, and your experience and positive attitude are an inspiration to all.